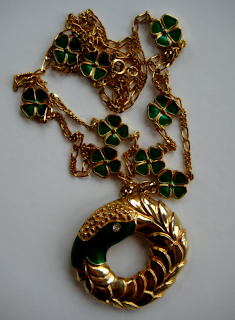 Lanvin vintage 1970s necklace with green cloverleaves and bird hanger. 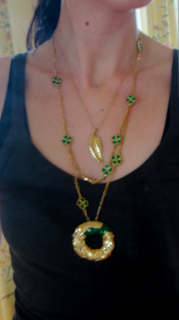 I´m always on the run to get my hands on "green-colored" vintage Lanvin necklaces. Received this from an argentinian jewelry seller on ebay. great colour, it's quite similar to that one Angelina wore on Oscars. Gorgeous! i love the green cloverleafs! Great blog! Lanvin is my favorite line so I truly appreciate all this! Gorgeous stuff. OMG this chain is beautiful ! Thanks for all your lovely comments!!!! i love it. the green is gorgeous! This is so pretty, I love the emerald! that is an AWESOME find! so cute! This necklace is beyoond gorgeous! and I love your blog fund... may I ask you a question? how could I put a printed fund in my blog. there are no words for this necklace, except: A-M-A-Z-I-N-G! I mean the background of your page! thanks very much! you're lovely! :$ this page's empty of really cute funds! This is beautiful. It must be worth a fortune. Vintage Lanvin; wow! Collection: 1970s Lanvin vintage 1970s acrylic pendant necklace in ivory/ gold. I purchased this beautiful vintage necklace a couple of weeks ago at Atlantis Home! Thank You Judy!! Me and Mietz have a fashion blog called The Little Fashion Treasury. Mietz is a little white fluffy cat who loves to travel and enjoys the little things in life. He made friendship with Cluni, a skunk, this summer. We love to collect vintage jewelries or finding some beautiful pieces from older collections on ebay.